Michael Jewett, assistant professor of chemical and biological engineering in the McCormick School of Engineering, has received the Camille Dreyfus Teacher-Scholar Award. The national award honors young faculty members in the chemical sciences who demonstrate leadership in research and education. The Camille and Henry Dreyfus Foundation is a leading non-profit organization devoted to the advancement of the chemical sciences. With the unrestricted $75,000 award, Jewett will advance his research on developing cell-free synthetic biology for biomanufacturing new classes of life-saving drugs, sustainable chemicals, and novel materials from renewable resources. A specific focus of the award is to enhance undergraduate education by training student-researchers to perform cutting-edge work in the chemical sciences. 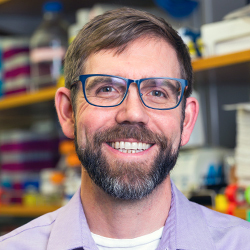 Jewett, who joined Northwestern in 2009, has made marked contributions to the field of integrated systems biology and is a pioneer in the synthetic biology field. He and his lab engineer biological systems to understand how the living world works and to harness biology to meet societal needs. He is a member of Northwestern’s Chemistry of Life Processes Institute, the Northwestern Institute on Complex Systems, and the Robert H. Lurie Comprehensive Cancer Center. Jewett has received numerous awards throughout his career, including the David and Lucile Packard Fellowship for Science and Engineering, NIH Pathway to Independence Award, Cole-Higgins Award for Teaching Excellence, Agilent Early Career Award, 3M Non-tenured Faculty Award, and DARPA Young Faculty Award.